Even from the start “Year’s Best Weird Fiction” was surrounded by positive vibe, successfully funded through an Indiegogo campaign the first volume of this short fiction collection, bearing the mark of Undertow Books and ChiZine Publications, two of the most prestigious publishers of weird fiction, and edited by Laird Barron and Michael Kelly, in their turn two of the genre modern masters, “Year’s Best Weird Fiction” continued to further its initial success by becoming the most sold ebook of ChiZine Publications and by entering on Locus Magazine’s 2014 recommended reading. These are no small achievements, weird fiction is a hard seller and it has difficulties in finding its place on the market. But isn’t the struggle of labeling this sort of fiction an appealing situation for the weird genre? Although it could be argued that weird is a label after all. Still, its power of reaching across various other genres and transforming them into something unique makes weird fiction a very interesting genre from my point of view. And I like to believe that its ability of stepping over boundaries made “Year’s Best Weird Fiction” such a successful project. This year sees the release of the second volume of “Year’s Best Weird Fiction”, edited this time by Kathe Koja and Michael Kelly and published by the same team of Undertow Books and ChiZine Publications. 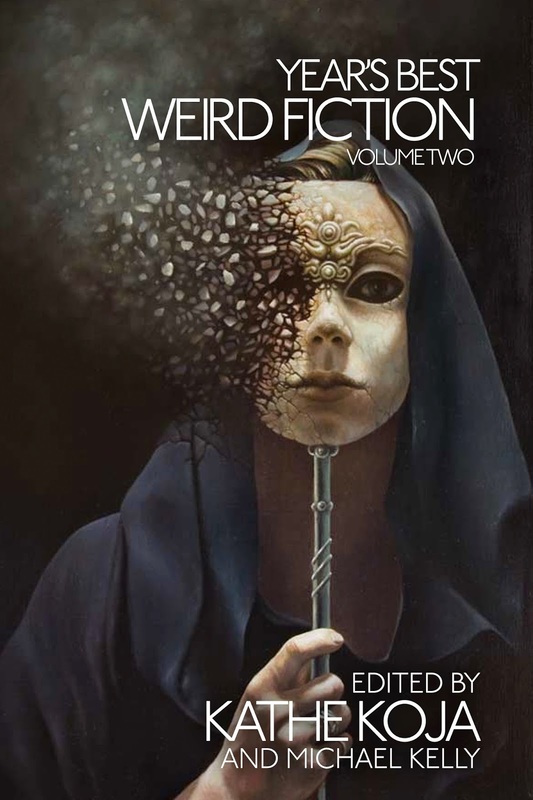 With the recently revealing of “Year’s Best Weird Fiction Volume 2” table of contents it seems that the second installment of this collection holds at least as much promise as the first. I say this with assurance since if I had to choose a single story as guide from this table of contents I’d be more than happy to select Isabel Yap’s “A Cup of Salt Tears”, a wonderful and very touching story, one of my favorites from the previous reading year. Another interesting aspect to be noted on the table of contents is that plenty of the short stories included in this second volume of “Year’s Best Weird Fiction” come from online mediums, Tor.com, Shimmer Magazine, Strange Horizons, Subterranean Press Magazine, Crossed Genres or Lightspeed Magazine are venues of short fiction that can be enjoyed online. I find it very interesting because it seems not only that the speculative fiction market is changing, though it is only natural for this to happen, but also that the quality of online fiction and editorial work put behind these projects is growing constantly. It offers me more reasons for being optimistic about the future of speculative short fiction. I am certain that “Year’s Best Weird Fiction Volume 2” would rise to the level of quality to be expected from Undertow Books, especially when the cover is a landmark on itself as well, the artwork of Tomasz Alen Kopera is mesmerizing and intriguing, another excellent point of attraction for the second volume of “Year’s Best Weird Fiction”.